…December tomorrow. How did that happen? However they have longer yet. We have, I believe, 3 boys. Two are definiately absolutely all male. They look a little unsure in this picture, that is because I snuck up on them before they had time to puff up. The two butch boys spend a lot of time ‘showing’ all fluffed up and strutting around and clicking at each other, and I suspect wasting energy that they could use putting in weight on. The other one.. who is at the back in this picture looking decidedly girly, has also done a little bit of fluffing and strutting, but I think he is mainly undecided and probably just a little bit squashed but the macho vibes of the other two. Not a bad strategy though, as he(she) spends must less time trying to prove anything. They are quite different from last years, they are more athletic for a start, perch on the inner dividing wall of their house and we have had to add extra fencing as they kept flying out of their pen! They weren’t really sure what to do next and would walk about on the roof of their house whistling and gobbling.. as they do. 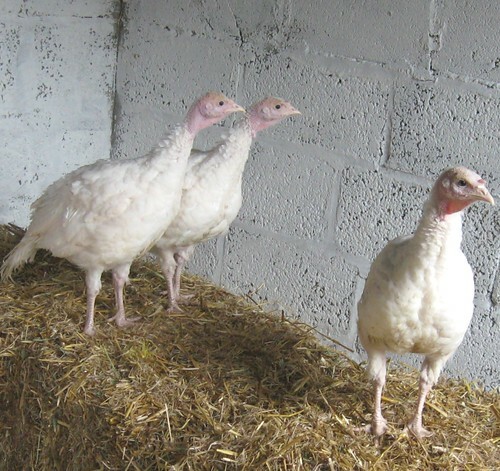 Last year’s turkeys could hardly hop on to a straw bale – but they were heavier. Yesterday we went over to collect our turkey poults from Sandra of Bellecross Hens. After a lovely chat and a look around some of her chicken pens, we brought these three home – a better trip than last year – those barked loudly all the way home, but these just whistled at each other. They seemed pleased with their accomodation, hopped up onto their straw bale perches and commented on the decor with a series of whistles and chirps. They even found the food and water without help. Over the weekend we put both turkeys in the freezer (dead first!). The limping one was not improving, and so we felt it was time. Then it did seem mean and unnecessary to leave the other one alone. I did wonder i they would be skinny as it is a tad earlier than advertised, but they came in at 14lbs and 19 lbs, – undressed and drawn, and the breast looks good on both. Bit sad.. now we don’t have turkeys either. Definitely feeling a bit autumn winter, as the numbers go down. 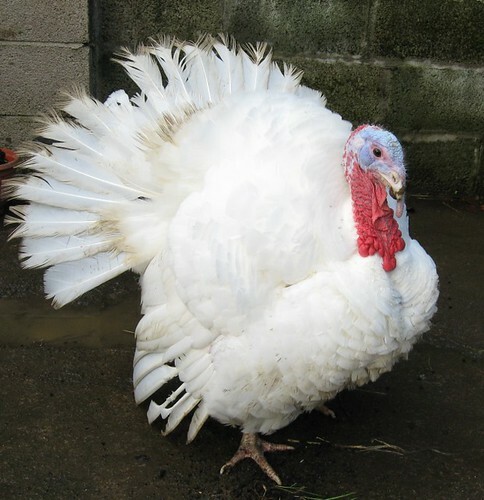 But to have turkey that had a good life, and a swift end is a pleasing thought. The freezers are now stuffed. Boris the larger of the two stags, always shows off to me, big fan tails etc, but I only have to take a step towards him and he backs off. But not it seems, if I am overly colourful.. I think I must appear like a large peacock to him, and he felt threatened? I dunno.. but he had a go at me this morning. This afternoon- back in working jumper, and he was easy going again. and it might come sooner, as the other turkey – also a stag, Becker, is Mr limpy. He doesn’t seem unwell, droppings are normal, looks ok. but it’s obviously painful to get around. We have checked for obvious treatable injury. Nothing. Perhaps, he is just to heavy for his own legs.. they do say this happens in the commercial breeds. or perhaps he has hurt himself. Possibly in a scuffle with his mate. The thing is, we want to raise our animals humanely, and this is getting a bit borderline. And they are now over 20 weeks of age. So perhaps it is time for Becker. And then will be it mean to keep just one? 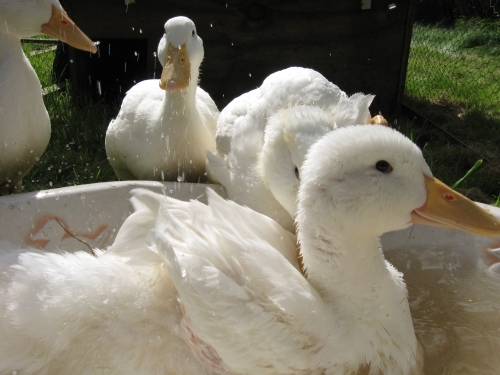 They are lovely, have outgrown their bowl pond are are making use of an old tin baby bath (complete with pink ducks!) hurray for freecycle. We are nearly finished on phase one of the duck run, so they will have more water and more room to run about soon. 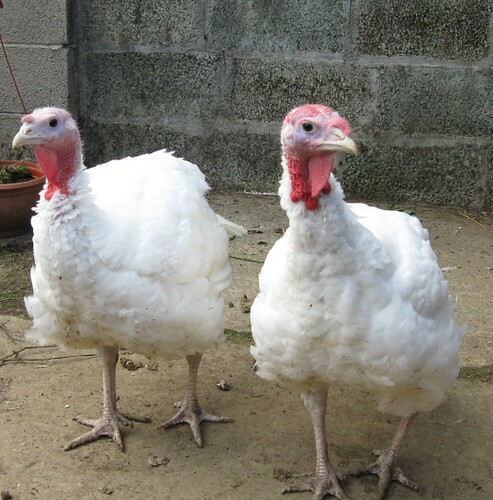 Meanwhile the turkeys are also increasing in size dramatically. They seem very heavy on their feet – Not sure if they will make it to thingymas. Totally new to turkey keeping.. so learning as we go along. I think they are both boys.. one seems definitely, the other not so sure! – but we had visitors looking at them at the weekend, and they both ‘showed’ to them – all fan tails and fluffed up feathers. They change colour all the time depending on how excited they are… so odd. The ducks are charming… the turkeys are ugly, it has to be said. Serious amounts of rain fell today. The street flooded, the drains overwhelmed, and then all that water headed down our lane. I had to go out with a spade and dig out a trench to save one of the outbuildings. The birds and animals were underwhelmed, and largely stayed in their shelters grumbling. 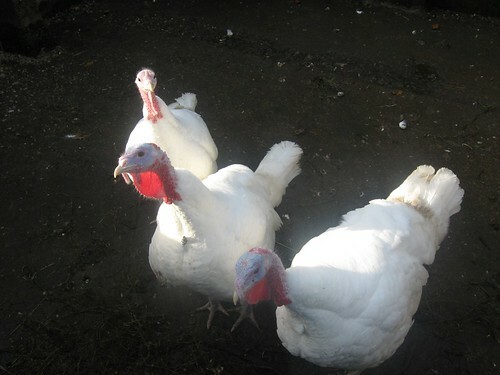 Actually I shut the turkeys into theirs, as they are stupid enough just to stand about in the rain. And we went out in raincoats and waterproof trousers and wellies, and picked beans, and courgettes and cucumbers. Like you do. After we had the turkeys a few days we noticed they were not getting through a lot of water. We made excuses.. the hens drink more of course, but there are more of them and they are laying.. a couple of young turkeys wont get through much. We decided perhaps the level had gone down a bit. Then we felt sure they were not drinking. I went back to the first picture I took of them – and there in the background is the water feeder.. showing exactly the same level, and by then it had been a week! Aghast, we went to see them, and himself splashed about in the water. You could see them having a light bulb sort of moment… and they rushed over and drank and drank. Thick birds, did not recognise water when they saw it.. and we showed it to them…. I was worried we would lose them already.